Their most well known songs include the disco hits "That's the Way (I Like It)", "(Shake, Shake, Shake) Shake Your Booty", "I'm Your Boogie Man", "Keep It Comin' Love", "Get Down Tonight", "Give It Up", and "Please Don't Go". They took their name from Casey's last name ("KC") and the "Sunshine Band" from a type of amphetamines. The group was formed by Richard Finch, a budding studio engineer prodigy at TK Records and Harry Wayne Casey ("KC"), a record store employee and part-timer at TK Records in Miami. Though both worked at TK Records, their meeting was not immediate, with Finch spending much of his time in the recording studio working with other TK artists and Casey on the phones at the front desk. An introduction by Clarence Reid through a mutual friend was the beginning of their musical connection. Following demo work, Casey and Finch were encouraged to create their own group. The initial members were just Casey and Finch (first starting out as songwriting collaborators), but Finch soon added guitarist Jerome Smith (June 18, 1953 - July 28, 2000), and drummer Robert Johnson, both TK studio musicians. The first few songs, "Blow Your Whistle" (September 1973) and "Sound Your Funky Horn" (February 1974), were released as singles, and had limited impact. However, a side project writing and producing music for George McCrae took Finch and Casey's "Rock Your Baby", featuring Smith on guitar, and made it a hit in mid-1974, selling 11 million copies worldwide. The band's "Queen of Clubs", which featured uncredited vocals by George McCrae, was a hit in England, peaking at #7, and they went on tour to England in 1975 off that success. 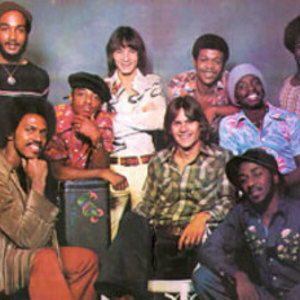 With the release of the self titled triple platinum second album KC and the Sunshine Band in 1975 came the group's first major US hit with "Get Down Tonight". It topped the R&B chart in April and the Billboard chart in August. "That's the Way (I Like It)" also became a number one hit in November 1975 and the group did well at the 1976 Grammy Awards. The 1976 album Part 3 yielded three top 5 singles: "I'm Your Boogie Man", "(Shake, Shake, Shake) Shake Your Booty" and "Keep It Comin' Love". Their success lasted until the fifth album and 1979?80; their last chart topping hit was "Please Don't Go" in December 1979, hitting #1 for one week in January 1980, and becoming the first #1 hit of the 1980s. With the declining popularity of disco, the group explored other styles and changed labels, joining Epic Records in 1980 after TK Records went bankrupt. In 1981, the partnership between Finch, and Casey came to an acrimonious end. Two years after the release of the previous album, the group released two solo albums with new material, geared toward pop: The Painter and Space Cadet. These albums generated little success, but in 1982, a hit track called "Give It Up" on the album All in a Night's Work (recorded before Casey and Finch split partnership) brought a return to success in the UK, and appeared two years later on the United States Billboard Top 40. The song was also featured on the band's next album, 1984's KC Ten. Epic Records, however, refused to issue the song as a single due to its prior failure in the US. Because of this, a frustrated Casey formed Meca Records*, releasing the single himself on this label in a final attempt to garner the song some success in America. It worked, but the album still failed to surpass expectations. This led to the group falling into stasis around 1985 with Casey's retirement. A revival in the interest of disco music in 1991 brought Casey out of retirement. He reformed the group with entirely new members except for the percussionist and began touring once again. Some of the original members of the band are now deceased. The new band has released a large number of compilation albums through Rhino Records, featured along with some newly recorded material. The album Oh Yeah! was released in 1993 after a ten year gap between new albums, excluding compilations. On July 28, 2000, Jerome Smith (rhythm guitar) died accidentally while working as a bulldozer operator. In 2001, the band made a brief comeback into the music scene after an eight-year lull with the release of a new album titled I'll Be There For You. The album was praised by critics, but it failed to generate any impact on the charts or in sales. More recently, the group had an appearance in the 2003 remake of the movie The In-Laws. Several KC/Finch songs have been included in the Dance Dance Revolution series of dance video games. That's the Way (I Like It) was included in the original Dance Dance Revolution, Shake Your Booty was in Dance Dance Revolution 4thMix and Get Down Tonight was in the American home version of DDRMAX2. Additionally, many KC/Finch songs, most frequently "I Get Lifted," have been sampled for hip hop songs.